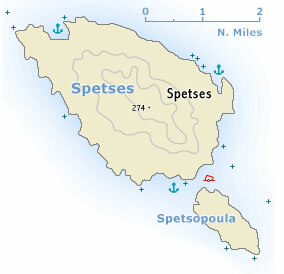 Spetsai - Spetses - Σπέτσες, the ancient Pityousa (Island of Pines), is a hilly and well-wooded island off the south-west coast of the Argolida. The income of the inhabitants, who are mostly of Albanian descent, comes from farming and now, to an even greater extent, from the tourist trade, for the island’s mild climate attracts large numbers of holiday-makers. This mild climate is described by the Admiralty pilot to be “exceedingly healthy” and is indeed more appealing than Hydra or Dokos. No motor vehicles are allowed on Spetses apart from public service vehicles. In antiquity Spetses was an island of no importance. After the Orlov Rising, a rebellion against the Turks supported by Catherine of Great Russia, the population was expelled from the island in 1770 and Spetses town was laid waste. The inhabitants soon returned to their island, however, and their trading and seafaring activities brought them prosperity. In 1821 Spetsai was the first island to take part in the War of Independence: an event commemorated every year by ceremonies in the Madonna Armada Chapel in Ayia Marina. The island’s capital, Spetses (pop. 3000), is built on the gentle slopes above the wide bay containing its harbour. The present town, with a number of handsome mansions and three interesting churches in Kastelli, the upper town, dates from the 19th c. There is a local museum in a late 19th c. mansion. The circuit of the island (12 km) is a pleasant day’s walk, or it can be done in a horse-drawn carriage. In the bay of Spetses you can anchor and take a long line to the shore or – if you are early and there is room – you can moor stern-to or bows-to in the inner harbour. 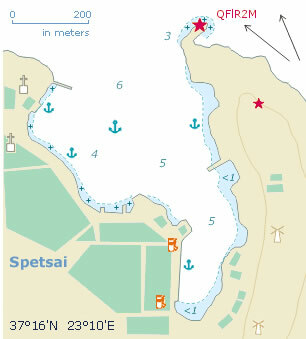 At the north-west corner of the island is a bay with a cove. This attractive anchorage provides shelter to all but NE winds.